"Most important of all, high school students need to be granted much more agency, responsibility and choice. While there are some things that everyone should know, much of what will help students in college and beyond are skills: the ability to speak and write persuasively, to reason and engage with one another’s reasoning and to think about core content in complicated ways." Mehta is an associate professor at the Harvard Graduate School of Education. He earned his B.A. in Social Studies, M.A. in Sociology, and Ph.D. in Sociology and Social Policy, all from Harvard University. His research explores the role of different forms of knowledge in tackling major social and political problems, particularly problems of human improvement. He has also written extensively on what it would take to improve American education, with a particular focus on the professionalization of teaching. 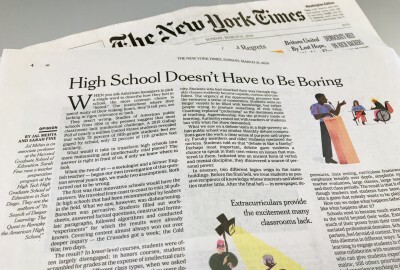 Read “High School Doesn’t Have to Be Boring” here.